Romaine lettuce is one of the most popular of lettuces in both the garden, and the kitchen. Gardener's love it because it is fast growing, and forms a loose head, that is easy to harvest. It takes up little space in the garden, too. Sweet and delicious, Roman Emperor Caesar knew what the best tasting lettuce was. Romaine lettuce is the basics for Caesar Salad. Parris Island, or Cos, is by far the most popular variety of Romaine lettuce. Baby Romaine grows smaller and matures sooner. Red Romaine adds color to salad bowls and as a garnish. Romaine lettuce is ready to harvest in 65-70 days. Baby Romaine is ready in about 55-60 days. Like other lettuces, Romaine lettuce seeds are very fine. Plant in rows, spreading the seeds as thinly as possible. No matter how hard you try, the seeds are very difficult to disperse. Thinning seedlings is must. Cover the seeds with a very fine layer of loose soil or starting mixture. Romaine is a good candidate for an indoor start. They transplant easily. You can also plant indoors in pots, or in container gardens on the deck. When transplanting in the garden, is is much easier to give them the proper spacing. Final spacing of the plants should be 12" apart, in rows 18" apart. For maximum growth, avoid overcrowding. Whether starting indoors or out, you will likely want to transplant your seedlings with the proper spacing for fast, full development. 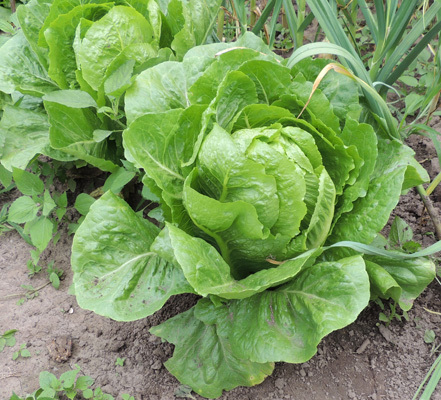 Romaine plants like cool weather and lots of moisture in rich, well drained soil. Transplanting should only be done in cool, preferably cloudy weather. If the weather is hot and sunny, we recommend putting off transplanting, if possible. If this is not possible, then transplant in the early evening hours. Water thoroughly and every day after, unless it rains, for about a week. The key to growing crisp, sweet Romaine lettuce, is to get it growing at a fast pace. That means plenty of water, and a healthy dose of fertilizer. Tip: When transplanting lettuce in hot weather, place some form of sun shade over the plant for a couple of days. Any makeshift shade will do. Succession planting is a common and useful practice. 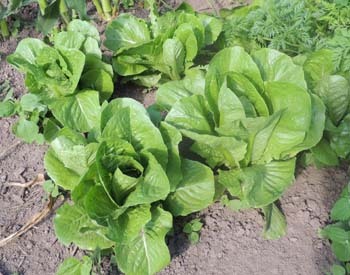 Plant successive crops for a constant supply of Romaine all season long. Plant small rows or sections of your garden with Romaine every two weeks. Keep Romaine lettuce plants weeded. This will allow maximum sunlight, moisture and nutrients to reach the plant. You can pick Romaine as soon as it is big enough to use. The outer leaves can be picked and the inner leaves allowed to grow. Or, use the plants pulled while thinning. After cutting, Romaine will regrow, but will not be one nice, neat head. It's better to start a new plant. Bunnies like lettuce. Got bunnies!? Then, a rabbit fence is in your future. A variety of insects can pose a real problem. Lettuce is delicate and can absorb many insecticides. If you want or need to use insecticides, look for brands that are less harmful to you and the environment. We like to avoid insecticides on leafy vegetables wherever possible. we suggest organic sprays, and a willingness to give up some of the harvest to insects, versus using pesticides. After all, one of the reasons most of us have gardens is to avoid the pesticides. Slugs are a real problem for all types of lettuces. There are a variety of control methods. More on Slugs and snails. Romaine lettuce will wilt and rot in hot, humid weather. The plant will also bolt or go to seed stage in higher heat. Heading or bunching types are more susceptible to rotting and bolting. Leaf types grow and mature quickly, and have fewer disease problems. Plant Problems - Diagnosis, causes and cures for many common plant problems. Romaine lettuce thrives in cooler weather, with moderate moisture. It is not fond of mid-summer heat, or dry conditions. Many gardeners will plant a crop for spring and early summer harvest, leaving the mid summer months to the tomatoes and the corn. Then, as the late summer heat begins to wane, they plant a new lettuce crop for a fall harvest.